No corners have been cut here! 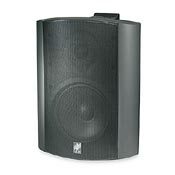 The OS-20 is a highly reliable loudspeaker in any environment. The long-throw woofer has a mica-filled poly cone that is impervious to moisture, and light enough to respond quickly to transients â€” yet also rigid enough to cleanly handle sustained high output. High frequencies are clean and well-defined thanks to Niles's ElastoDynamicâ„¢ wide-dispersion dome tweeter â€” an innovation that employs a cloth-fiber substrate with a microscopic coating. The result is a tweeter that repels water and produces very smooth, natural highs. With its elegantly tapered cabinet and rustproof, pivoting mounting bracket, the OS-20 is designed to fit neatly into corners and/or under eaves. The speakers can be painted and each speaker comes with full painting instructions and paint mask â€” so these speakers will look great in your backyard or in your living room! Consider them ideal for bringing music outdoors, or for use as surround speakers in your home theater. Available in white or black. Fantastic speakers. Really good bass considering the size of it. They still look brand new after 4 years of usage.